We got hit with the Snowpocolypse. It was a Blizzaster. This is the view in front of our place. 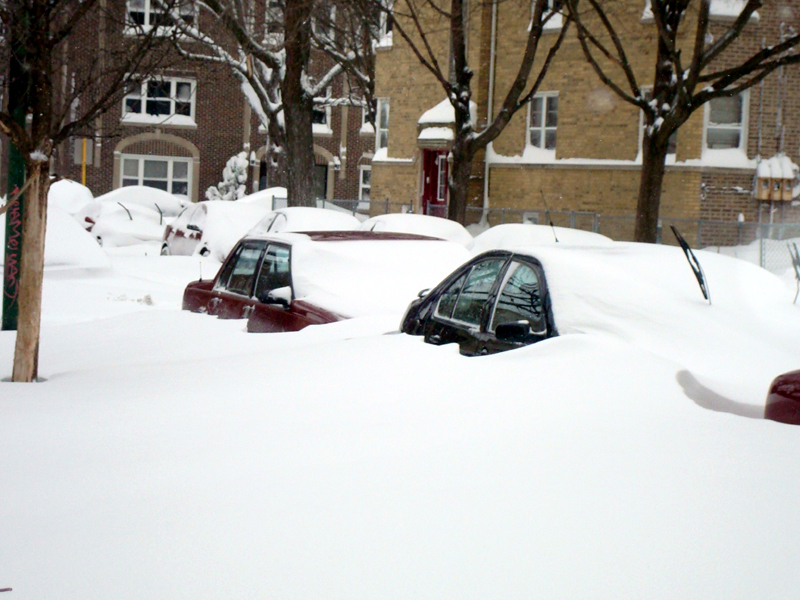 There are cars in there, parked on the street. Can you find them? Their owners can’t, either! 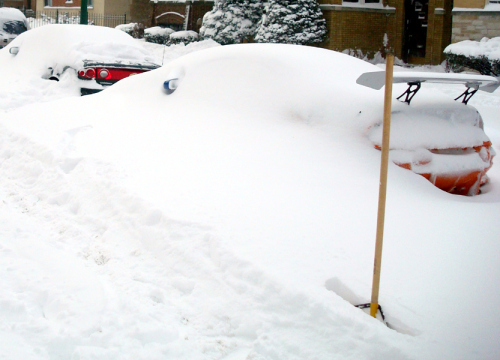 The snow in the street is over 2 feet deep, and drifting over the cars to over 5 feet. It is solid snow across the street. No plows here! 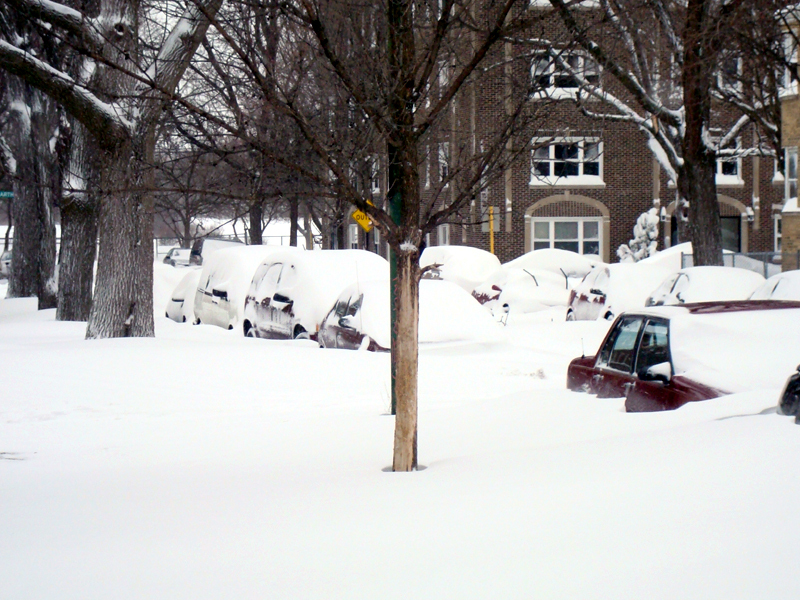 Storm is over, but no plows yet! If we are lucky, we might see them in April. First priority: find the front door. As it turns out, this was harder than you might think. 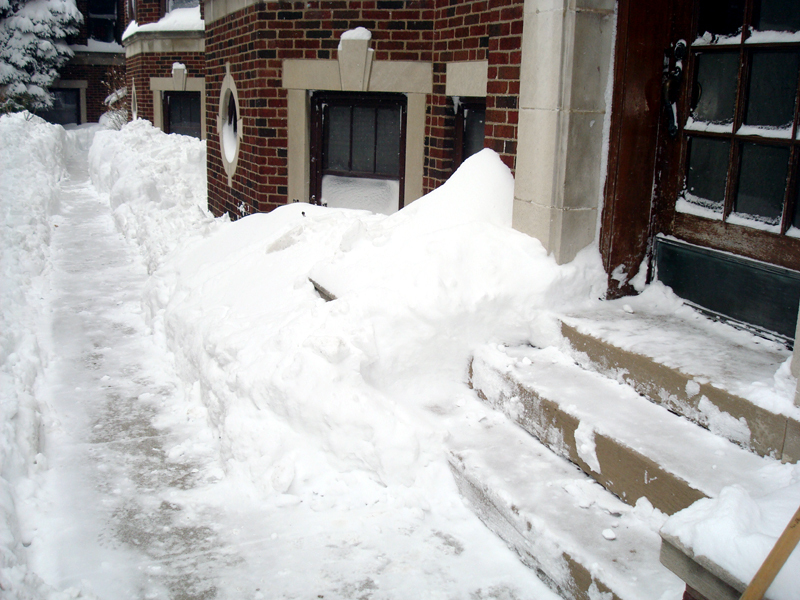 Snow drifted up over the stairs and front door. 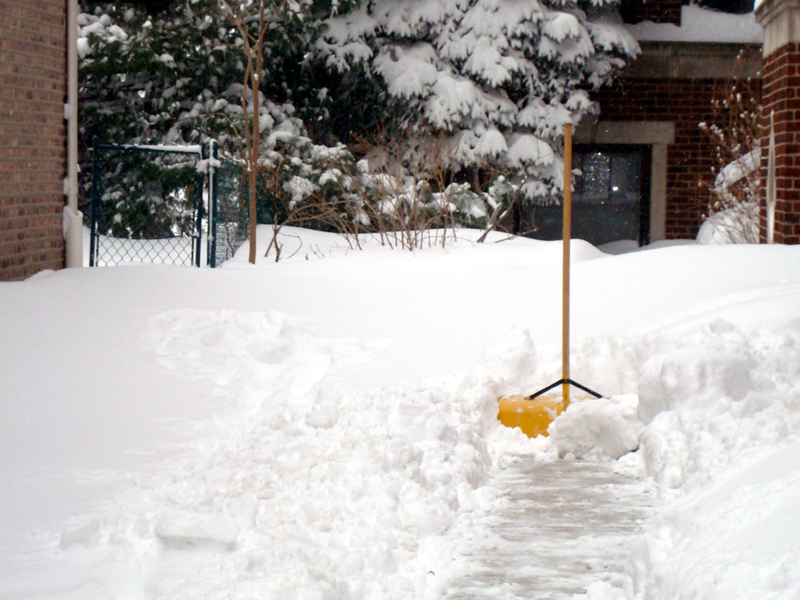 Step 2: start shoveling toward the neighbours. 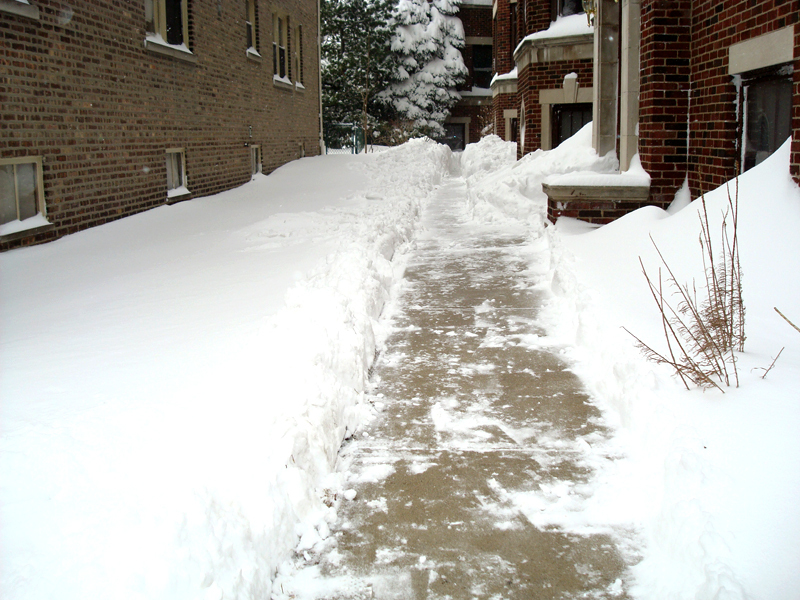 The drift across the sidewalk was 4 feet high. Here is our real estate tip for you: don’t buy a house with a 200 yard sidewalk. 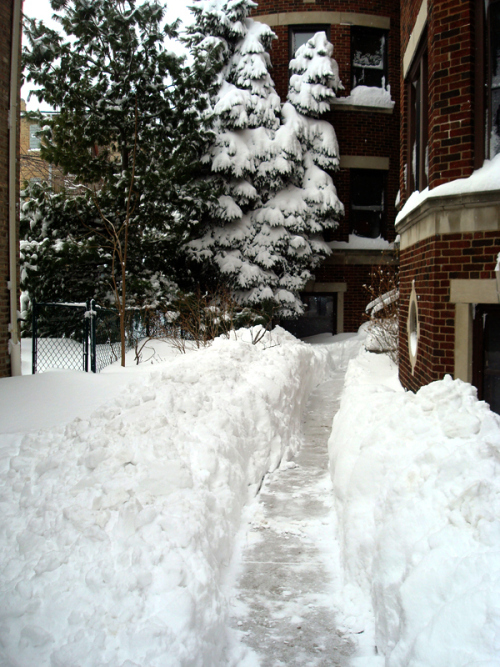 I wish I had thought to have someone stand here, to demonstrate how deep this path had to be shoveled, but this might actually be my proudest moment, getting through the drift to the people behind us, who are really insistent on things like “being able to exit their home in case of emergency”. Step 2: find your car. Here is mine. 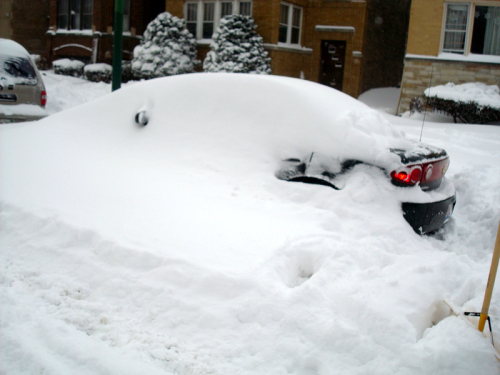 I actually had the best spot on the street; the first legal parking spot past the fireplug, which meant that the blowing snow was not accumulating on my car at all and was drifting instead across the fireplug and the street in front of it, and my car was totally bare… until…. at midnight, this idiot decided to park illegally behind me, by ramming his car repeatedly into the side of the drift until he was off the street, and then, leaving his hazards on all night, walked into his place across the street. 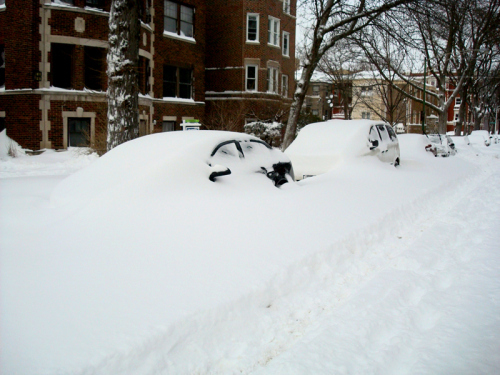 Putting his car behind mine made the snow start to drift up over both of our cars, leaving us like this. Also, his battery is dead, so his car isn’t moving. Ugh, ugh, ugh! But the good news is, we didn’t lose power, the kids stayed in their jammies all day, and we spent most of it watching Curious George, eating fudge, and playing games. And planning to move to North Carolina. Everyone who knows us knows that we are a deeply spiritual family, dedicated to keeping the Christmas holiday as an opportunity for reflection on the True Meaning of the Season. And so it came as a shock to have this horrible bloody tragedy occur in a nearby suburb before we could even finish our Xmas shopping. Our condolences to all those who lost a loved one to this awful and senseless rampage. Remember September? Where did it go? We have no idea, either. Luckily, M jotted down some notes for us. Lots of pictures below, and an actual update of the month. The funnest thing about toddlers is watching them change, literally hour by hour, before your eyes, from babies to kids. Kids with opinions on what to eat, what to watch, what to do, what you should be doing, and what you are doing wrong. It is non-stop hilarity. We live on the border of a big city park – golf course, skate park, batting cages, soccer fields, BBQ and party spaces, two separate playscapes for little kids, and a toboggan hill. So naturally, when we want to take the kids to the park, we get in the car and drive two blocks north of our park to another park, a tiny pocket-park, because the playscapes in our park are not fenced, and every time the kids run, they do so in opposite directions at top speed, and there isn’t enough Xanax in this state to help us when that happens. But this little park is cute – a few swings, a climbing structure, and some benches and grass, all the size of one city lot, and fully fenced. And almost always empty, since it sits on a street of single-family dwellings, who presumably all have backyards of their own and don’t need a park. Hey, Chicago, your awesome city planning is awesome. M loves to have a magic wand, and her conjuring skillz are epic. Treehuggers. We are raising treehuggers. This video and these pics are actually from August 1st. We mention it because the kids look so little in them! August was on of those months that they grew 8 inches and got 3 years older in just 30 days. But this video also cracks us up, because this is a taste of what we see every day – both girls cracking themselves and each other up. And that incessant buzzsaw in the background is Cicadas – its been a big year for them in Chicago. It seems grandma accidentally confused her grandchildren with the garnish tray on the bar at her local TGIFridays – again! These kids are all ready to pop into a cold gin-and-tonic, or garnish a nice, deep glass of sangria. For more updates and ridiculousness, click below.